Agriculture contributes 34% to the GDP and provides livelihood to 68% of Nepalese people. However, Nepal is still unable to meet the domestic food demand. In 2011, nearly 51% of districts were food insecure. Impactful strategic mini-research projects may serve as major contributing factors in improving the food insecurity situation in Nepal. Considering this situation, NAPA brings forward a ‘research mini-grant’ approach on the occasion of World Food Day, October 16, 2018 to celebrate the theme “Our Actions Are Our Future.” Through this approach, NAPA aims toward increasing food production capacity of rural producers and the professional development of students, faculty, and professionals engaged in agricultural and natural resources thereby greatly impacting the agricultural economy. NAPA hereby requests all research and development well-wishers to contribute to ‘research mini-grant pool fund.’ Your willingness and support toward increasing people’s access to sufficient and safe food for a healthy living is much appreciated as every dollar has the power of making an immense change. Initiate small-scale high-impact collaborative research with teaching, research, and development institutions in Nepal. Anyone willing to be a part of MGP to promote collaborative research activities in Nepal may join NAPA to highlight the need for research in agricultural and allied disciplines and empower researchers in rural communities of Nepal (in this initial phase). You have the opportunity to support these genius minds and their ideas and make significant impact toward improving current agricultural enterprises and developing strategies to make staple food accessible and ample for the rural community. We, therefore, request all of you (great minds, generous hearts, and open hands) to select one of the two options below to implement the pilot concept of ‘collaborative research’ for professional development and capacity building. Your contribution to this MGP pilot project will be recognized per your desire and specification to contribute (discipline, institution, and specific project). The NAPA Treasurer and the designated committee (DC) in consultation with the contributors/donors/sponsors will oversee the MGP funds, implementation, outcome, and quality control. The DC in consultation with the executive committee (EC) shall prepare guidelines, call proposals, evaluate, and recommend selected proposals for funding. NAPA respectfully requests all generous donors to spare a few dollars by sacrificing small expenses (such as coffee/tea/drinks/movie/dining out etc.) for the next few months in order to generate a mini-grant pool money for collaborative research. More importantly, we seek MGP sponsors to support collaborative research for developing capacity of undergraduate/graduate students, local faculty, and post graduate professionals ($100 and $200 levels). Therefore, you have been invited to make a difference in research-based agricultural education in Nepal by sponsoring at least one mini-grant for an impactful scientific investigation. Your generosity is NAPA’s inspiration to serve the community back in the motherland and beyond. So, contribution by October 15, 2018, will be much appreciated as we are planning to release the first opportunity of the mini-grants for collaborative research in the year 2019. If you have any questions or concerns, please contact Vice President, Dr. Megha N. Parajulee at napa2072@gmail.com for further details. Firstly, I salute all those hard-working previous Executive Committee (EC) officials and members (2016-2018) for their unwavering contribution to this enduring journey of NAPA from day one – thus far. In addition, I would like to welcome new EC officials and members (2018-2020) onboard for getting ready to work relentlessly to make a difference. Secondly, on behalf of the First NAPA Biennial Scientific Confer-ence Organizing Committee, and the previous EC (2016-2018), I feel honored to express our great appre-ciation and sincere thanks to all generous donors, self-motivated volunteers, moderators, presenters, editors, committee and event chairs, poets, evaluators, judges, athletes, and artists for their incredible contributions, which made the conference exceptional. The confer-ence was a huge success as an overwhelming majority of the participants reported that they thoroughly en-joyed the jam-packed events set forth during the con-ference. 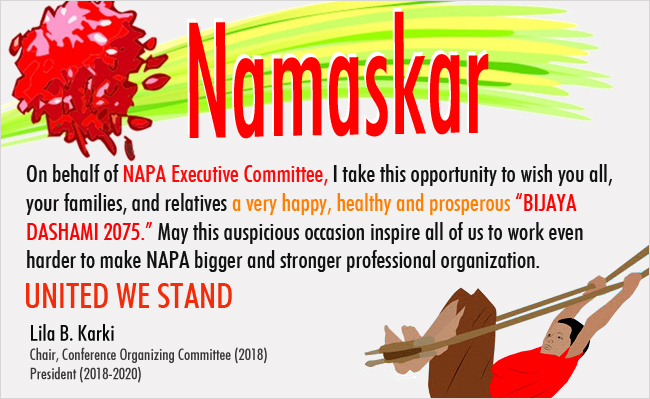 Thirdly, thank you all NAPA members for giving opportunity to all of us “2018-2020 EC” to serve the community and beyond by expanding its mis-sion and vision around the globe. Most importantly, I welcome heartily on-board and thank sincerely the following outstanding community leaders for their willingness in serving the NAPA community with full energy, ideas, and dedication through various flagship activi-ties: Dr. Nityananda Khanal, Chair, Agri-Connection; Dr. Ramjee Ghimire, Chair, Research/Policy Brief; Mr. Shankar Prasad Gaire, Chair, Student Coordination Committee; Dr. Rajan Ghimire, Chair, Scholarships for Aca-demic Excellence; Dr. Drona P. Rasali, Chair and Dr. Prem Bhandari, Managing Editor, Book Publication Committee; Dr. Megha N. Parajulee, Chair, Global Journal of Agricultural & Allied Sciences; Dr. Pradeep Wagle, Chair, Member-ship Drive Committee; Dr. Ananta Acharya, Chair, Information & Technology support; Mr. Tanka Kafle, Webmaster, and their respective team members. We appeal to all members for your continued contribu-tion to propel NAPA to become one of the vibrant professional organizations in our time. Last but not the least, we highly appreciate all volunteer contributors to bring the first issue of Agri-Connection to fruition as the second EC for 2018-2020 starts its journey. Your team deserves sincere appreciation and thanks for working diligently, Dr. Nityananda Khanal. Together, we can make a difference. On behalf of the First NAPA Biennial Scientific Conference Organizing Committee and the previous Executive Committee (2016-2018), I feel honored to express our great appreciation for your active participation in the conference. The conference was a huge success and we have made history by hosting the competitive graduate oral and poster presentations, the student essay writing contest, the Agricultural poem contest, and professional oral and poster presentations. An overwhelming majority of the participants (over 100) reported that they thoroughly enjoyed the jam-packed events on both days (May 26-27). The pre-conference tour to the UDSA research laboratory, golf tournament, and the cultural night led by honorable consular general Prem Raja Mahat, followed by NAPA talents rocked the farewell night. I am truly thrilled to acknowledge all generous donors, self-motivated volunteers, moderators, evaluators, judges, athletes, and artists for their amazing contributions, which made this conference exceptional. I would also like to take this opportunity to congratulate all winners: of the student oral competition (Laxman Adhikari, Pramod Pantha, and Bijesh Mishra) and honorable mention (Vesh Raj Thapa); in the student poster competition (Sanjok Poudel, Sangita Karki, and Akriti Bhattarai), and honorable mention (Dikshit Poudel); of the agricultural poem competition (Sangita Karki, Shailes Bhattarai, and Laxman Adhikari); and the golf cup winners (Yogendra Timilsina, Aman Bhatta, and Bijesh Mishra). We gave away over two-thousand-dollars in cash prizes, and awarded winners plaques, appreciation certificates, and cups. Dear valued members, I thank all of you sincerely for being part of the NAPA community. I was amazed to have a small but enthusiastic team of dedicated volunteers who worked days and nights to make all of this happen.